The Outdoor Adventure Group has begun 2017 with monthly hikes. January was to Heber Springs Sugarloaf Mountain, February to the Middle District of the Buffalo River at Tyler Bend. 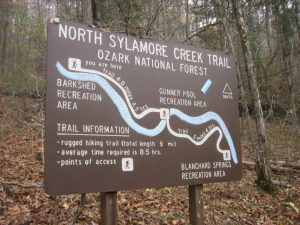 Please join us in March for a hike on Sylamore Trail. This is a birding hike. We will start at Blanchard Springs and hike in for 1 to 1 1/2 hours, and then return (2-3 hrs total). Edie Callaway, Fairfield Bay resident and experienced birder, will be with us, and she says that after 11:00 a.m. chances of spotting birds is slim and none. Meet Tuesday, March 7, at the Little Red parking lot on Sneed Drive at 7:30 a.m. The hike will start at the Blanchard Springs trail head. It will be a moderate hike. Following hikes, we all join together for lunch at a local family-owned restaurant. Good company, wonderful natural beauty, exercise and good eats. What’s not to like? If you would like to join us contact Jill Bailey, [email protected], or Tom Welch, [email protected] Looking forward. July: a kayak trip to Sugar Loaf Mt.